Side stories are a somewhat odd occurrence in the literary world. They’re essentially like the “deleted scenes” from movies: they don’t add to the plot, even if they are interesting by themselves. 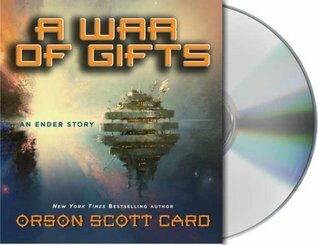 A War of Gifts is a side story to Ender’s Game that finds the reader back at the battle school during Ender Wiggin’s training period. While Ender’s Game is a tight piece of science fiction, with no room for a Santa Claus sup-plot, A War of Gifts does require some knowledge of the source material in order to understand this sub-plot. I am always in awe of Orson Scott Card’s ability to take some of the most basic ideas and make them the most profound, most philosophically-intriguing debates. In the case of A War of Gifts, we have a fundamentalist Christian who was taught that the more commercial aspects of Christmas (like Santa Claus, for instance) are pure evil. Butting up against this characters’ beliefs are a few homesick recruits who unwittingly bring his ire upon them for celebrating a holiday in a way that might be construed as “religious.” The conflict comes in defining the activities that do or do not abide by the school’s “no religion” policy. The debates of both sides are so well-described and thoroughly thought out that such a silly conflict suddenly becomes a multi-faceted problem with no easy solution. The reader also gets to see an Ender Wiggin who certainly has hints of his piercing personality that becomes present in the subsequent installments in the series. The specifics of A War of Gifts don’t lend themselves to being included in Ender’s Game, but it’s a delightful visit back to the world created therein. For fans of the series, they won’t be disappointed. For people who haven’t read the original story, A War of Gifts might be best saved for later. An engaging side-story in the world of Ender’s Game, I give A War of Gifts 4.0 stars out of 5.